The owner of Naperville’s oldest pet store will be honored Mother’s Day weekend for his move to stop selling puppies at his store and opting to rescue from high kill shelters. The Puppy Mill Project will be presenting Greg Gordon, owner of Dog Patch Pet and Feed with the Kindness to Animals Award at their Second Annual Mother’s in the Mills event on Saturday, May 12. “We have been working with pet stores for them to go humane – to stop selling dogs and opting to adopt out instead. Greg is a great example of how stores can make a successful transition,” says Cari Meyers, founder of the organization. Naperville pet store owner wins Kindness to Animals award — Naperville news, photos and events — TribLocal.com. 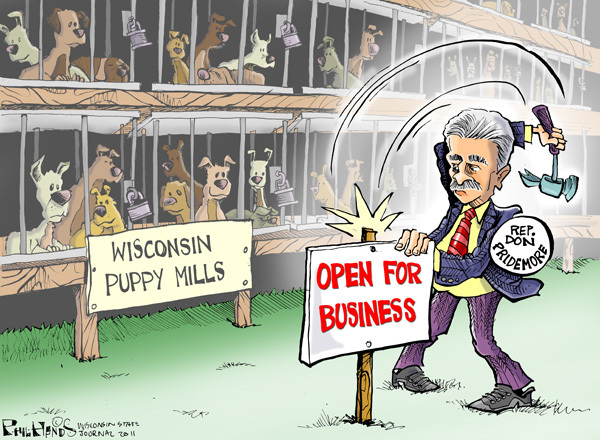 Hands on Wisconsin: Puppy Mills, open for business? Hands on Wisconsin: Puppy Mills, open for business?. Rep. Donald Pridemore (R-Hartford), one of the original co-sponsors of Act 90 (the puppy mill law), is now looking for support for a proposed bill that would be a backward move in Wisconsin legislation to regulate puppy mills. Act 90, which is now in place, requires anyone selling 25 or more dogs in a year, from more than 3 litters, to be licensed and regulated. Pridemore’s proposed bill (LRB 1798/1) seeks to raise the number from 25 to ONE HUNDRED dogs per year and to eliminate the positions of three DATCP inspectors recently hired to enforce Act 90. For more information and to see WHAT YOU CAN DO visit our webpage. HARTFORD – Despite legislation in 2009 to crackdown on puppy mills, a new proposal would ease restrictions on dog breeders. The proposal comes from one of the original co-sponsors of the bill, and now Representative Donald Pridemore of Hartford says the rules went too far. 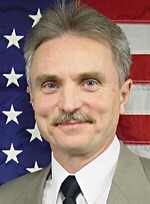 Representative Donald Pridemore changes his tune on puppy mill legislation – TODAY’S TMJ4. The next Petland protest in Janesville will be Sat, May 7, from 11:00 to 1:00. Hopefully the weather will be beautiful. We need all of you to come stand with us. Janesville has recently opened another pet store inside the Janesville Mall. It is more important now than ever to show Janesville and the world that we don’t want stores that make profit from abusing animals. So mark your calendars.